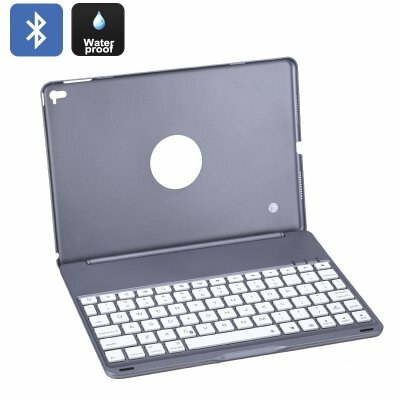 Successfully Added iPad Pro Portable Keyboard - Bluetooth, 7 Colors Keyboard Light, 100 Hours Battery Life, Light Weight, 10M Operating Distance to your Shopping Cart. Perfect for those who want to take the most out of their iPad, this Bluetooth keyboard allows you to write messages and reply to e-mails in no time and increases your portable productivity significantly. Simply place your iPad Pro in position and enjoy the typing speeds of a regular keyboard. No more stress over typos and a miniature touch screen keyboard - with this portable Bluetooth keyboard you can turn your iPad into a portable mini laptop. With its light weight and sleek design this iPad keyboard is incredibly portable. The perfect accessory to bring along on your next business trip or holiday, this Bluetooth keyboard allows you to take the most out of your iPad Pro. Featuring a powerful 150mAh built-in rechargeable lithium battery this Bluetooth keyboard lets you enjoy up to 100 hours of usage time on one single charge. Whether you use it to enhance your iPad gaming experience, write official documents, or to simply browse the web, this portable keyboard won’t be running out of juice any time soon. Offering as many as 7 different keyboard back light colors this portable Bluetooth keyboard is guaranteed fit your style. Efficiently write documents, reply to messages, or play games – with a range up to 10 meters this Bluetooth keyboard designed for the iPad Pro will increase your overall product experience greatly. The perfect accessory to turn your beloved iPad Pro into a more efficient device capable of handling the high capacity writing needs of every business person out there. This Bluetooth keyboard comes with a 12 months warranty, brought to you by the leader in Bluetooth keyboards as well as wholesale electronic gadgets..
Arabic: - لوحة مفاتيح Bluetooth المحمولة - Chinese Simplified: - 便携式蓝牙键盘 - Czech: - Přenosné Bluetooth klávesnice - Dutch: - Draagbare Bluetooth-toetsenbord - French: - Portable clavier Bluetooth - German: - Portable Bluetooth-Tastatur - Hebrew: - מקלדת Bluetooth ניידת - Hindi: - पोर्टेबल ब्लूटूथ कुंजीपटल - Hungarian: - Hordozható Bluetooth billentyűzet - Italian: - Tastiera Bluetooth portatile - Japanese: - ポータブルの Bluetooth キーボード - Korean: - 휴대용 블루투스 키보드 - Malay: - Papan kekunci Bluetooth mudah alih - Norwegian Bokmål: - Bærbare Bluetooth-tastatur - Romanian: - Portabil Bluetooth tastatură - Russian: - Портативный Bluetooth клавиатура - Spanish: - Teclado Bluetooth portátil - Thai: - คีย์บอร์ด Bluetooth แบบพกพา - Turkish: - Taşınabilir Bluetooth klavye - Vietnamese: - Bàn phím Bluetooth di động.